I just mentioned this tuner from Silicondust the other day and now Newegg has it at a discount price on it when using MasterPass checkout and a promo code. "Newegg has SiliconDust HDHomeRun Prime Triple Networked HDTV Tuner (HDHR3-CC) for $79.99 - $15 Off with MasterPass Checkout via Newegg Mobile App with promo code MBLMASTER15 = $64.99. Shipping is free. Thanks hookemut25"
The normal price for our HD DVR from Comcast is $20 a month. Thats pretty pricey. You could buy a TiVo Roamio for $150 and buy lifetime service for $500 but thats $650 total and pretty pricey too. Another solution is to use a CableCard tuner with your computer and make your own DVR. You can get a setup working to replace a DVR for $100-$200. This does require that you already have a computer and internet connection at home but I'm guessing thats a safe assumption. One such CableCard tuner is the SiliconDust HDHomeRun PRIME Currently those run about $100 on Amazon or Newegg, but you can watch for sales and discounts and probably get one a bit cheaper. If you want you can connect your TV directly to your computer and watch the programming like that but that may not be convenient or work well if your TV and computer aren't usually in the same rooms. The video recommends using media extenders like either a Ceton Echo ($100) or a Xbox 360 4GB ($176) to watch the programs on individual TVs. You can also pick up a refurbished Xbox 360 from Gamestop for $90-$120. Between a HDHomeRun PRIME and a Ceton Echo you're in for about $200 total to make your own DVR setup on one TV. You can cover more TVs with more Echos for $100 each. Note the video also recommends using wired ethernet connections instead of wireless. So that means you would have to have physical wired network cables connecting the HDHomeRun and the media extenders. Depending on your setup that may be more cumbersome. You can try wireless to see how well it works of course but note their recommendation is for wired connection. This kind of solution takes a little bit of technical savvy but its not nearly as complex as building a Linux based PC DVR. The boxes are designed to be more user friendly and are compatible with typical Windows OS systems that more of us are familiar with. I'd previously compiled a list of items that Amazon sells as Subscribe & Save products that cost under $2 first back in May and again in August. But the lists get out of date quick and so I like to refresh them. Note the list will get out of date within months or days. I'll probably post a newer list before all of the above items are gone or have price increases. But if you can't find something good here you can always go to Amazon and search for Subscribe & Save and sort based on prices nad poke around to find something cheap to use as a filler. I've looked at solar panels on and off and still haven't pulled the trigger to buy them. When I've evaluated the benefit in the past I've not placed any value in the panels themselves. I figured they were just going to be used up and depreciate in value until they are broken and thrown away in 20 or more years. But that is actually ignoring some good value in panels. Solar panels should increase the value of a home. I mean if you're looking at two identical homes and one has a solar panel on it then I'd certainly pay more for the house with the panels. If I assume a panel will save you $1 in electricity over 20 years then I would calculate the net present value of that at about $18.36. I could then add that value to the value of the house. If the panels are older and maybe only have say 10 years left in their life then I'd cut the value in half. "The National Renewable Energy Laboratory* offers a useful guide when determining how much your property’s value will go up. According to its research, each additional $1 in energy bill savings (from your solar installation) adds $20 to your home’s total value." *They had a link to the study but that link is now dead. "The premium ranged from $3.90 to $6.40 per watt of capacity, but tended most often to be about $5.50 per watt." Those are different measures. One is looking at savings to your energy bill and the other is looking at Watts capacity for the panels. How do they relate? You'd have to look the amount of sun you get locally to figure that. In my area I figure roughly that one W of capacity gives me about 30¢ a year in electricity savings. Of course it will be more or less depending on how much sun you get. But if I do the math then the NYT source is saying that most often the value is $5.5 per watt. If one W saves you $0.30 in electricity then that relates to valuing $1 of electricity savings at about $18.33. Almost exactly the same as my $18.36 NPV guess. I think the right way is to determine the energy savings and then figure what thats worth. Personally I think those estimates are a bit high. Or at least they seem to really be only looking at brand new panels. I can see spending that kind of money for a brand new panel but not an older one. Note that I'm only talking about panels you own outright. An NPR article pointed out that leased panels can be a negative. People don't understand the leased system and you don't actually own those panels. You can get free gift wrapping on Amazon purchases if you use the promo code DISCOVER and pay with your Discover card. The deal runs through December 25th. Note that not all items can be gift wrapped . And they put some items in gift bags, from Amazon.com "Because of their size or shape, some items can't be wrapped in paper or a box -- so we'll send them in a reusable, festive cloth gift bag." The fine print in the email I got also says that the offer does not apply to digital content. So theres that. You can activate all three right now. Grocery stores and gas are good categories. I've got the Barclay SallieMae card and get 5% on those but they're limited at $250 a month. We don't buy that much gas but we certainly spend more than $250 on grocery so I can use the Chase card for that category for sure. The average household spends about $330 a month on 'food at home' and $200 a month on gas so 5% back on those combined equates to nearly $80 in cash back for the quarter. Or about $64 above the 1% you would earn otherwise on typical cash back deals. If you don't bother to pay attention to news then you may have missed this story. Today, December 15th is the deadline to enroll in health insurance on the public exchange. Just an FYI. This deal will take a little bit of work and patience and its only useful if you have a need for diapers or baby wipes. Pampers has a program called Pampers Rewards. If you buy Pampers products they have rewards codes on them. You can then claim those rewards points on the Pampers Rewards website. So if you buy a lot of Pampers and save up the rewards you can cash them in for baby toys or similar kinds of free gifts. Nothing special here, its a typical marketing gimmick. Buy $1000 of diapers and you get enough points for a free $8 toy (or whatever). They also have a deal called Grow on which gives you extra rewards for entering at least one pampers rewards each month for multiple months. If you do it for 3 months you get a prize, if you do it for 6 months you get a bigger price, 9 months, and 12 months. So its an extra bonus reward for participating every month. It I assume helps keep people buying Pampers regularly. However they don't track when you buy the Pampers items. So if you're buying Pampers items you can save up your points codes and redeem them once a month rather then do them as you get them. If you spend ~$20-22 on a box of wipes packs on Amazon ( Pampers Natural Clean Wipes 12x Box with Tub 864 Count ) you'll have 12 codes. Use those once a month over a year and you'll get all the free gifts. So even if you use the Kirkland wipes at Costco or some other cheaper brand it could be worth getting some Pampers wipes just for the codes to get the free gifts. 3. Each month enter your rewards on the Pampers rewards site. 4. Cash in free gifts. I think the Shutterfly gifts are the best value there. So for a couple minutes a month for a year you can end up with 24 personalized labels, 25 photo cards, a personalized calendar and a 12x12 photo book. You may also have enough points from the wipes themselves for a minmal value free gift. To get even more you can look for free promotional points. At least a couple times a month I see free Pampers points shared on the Fatwallet forums free forum. So you can extra get free points there. However note that the free online points or promotional points you get do not count for Grow on. I"m sure that articles title is purposefully sensationalized to attract attention. But no, sorry, working at Amazon isn't worse than being homeless. "Superb performance did not guarantee job security." Thats actually true at most jobs really.
" it would be six months before I could receive my first unemployment compensation check." I don't know why. Shouldn't take 6 months and thats not under the control of the employer. Is there more to this story? What?
" I “flew a sign,” street parlance for panhandling with a piece of cardboard: ... I went to my usual flying spots around Seattle and made more money per hour protesting Amazon with my sign than I did while I worked with them. ... I created carefully crafted signs with cardboard and a Sharpie and, just like that, I was making money again. Hundred-dollar hours became the norm, not the exception." I bolded the bits above for emphasis. What this woman is really doing is begging for money and getting apparently quite a lot of it in Seattle. Thats not "being homeless" thats being a professional panhandler with a successful gimmick. I think this is the actual story here: Being a panhandler in Seattle who complains about Amazon is very lucrative. I'm not saying that I think working in an Amazon warehouse is fun or that they treat their workers well. I have no personal experience working in Amazon nor do I know anyone who does. There have been several reports describing the working condition in their warehouses and it doesn't sound fun (see several links in this article). A lot of that seems to be basically saying that working in an Amazon warehouse picking orders is a pretty crappy job. Its hot or freezing, its boring, they have mandatory overtime or send you home when theres no work. its exhausting tough work, they will fire you if you're late too many times, they demand performance quotas, etc. A lot of that is not so much about Amazon but more the nature of the job of working in a warehouse picking orders. The 3000+ reviews of Amazon on Glassdoor give it a 3.3 score which they put in the 'OK' category. So Amazon as a whole doesn't seem to be either a great nor an awful place to work, but simply well... OK. Its also important, I think, to note that a lot of the people in the warehouses seem to work for temp agencies rather than Amazon itself. While Amazon is responsible for managing those temp agencies they aren't directly at fault for poor treatment of temp employees working for a third party. Ebates has a bunch of stores offering double cash back today for Green Monday. I don't know what Green Monday is but who cares. To see the complete list go to Ebates and then click on the Green Monday banner in the middle of the sites front page. We have four small recessed lights in the ceiling of our hall. Originally all four were incandescent bulbs. They when I used up the last of my remaining incandescents I shopped around for replacements. The incandescent bulbs were around $3-4 each. I found LEDs for $10 each and decided to try one. I bought one Sylvania 6-Watt R20 Medium Base LED Flood and it worked fine. So then I bought 3 more to eventually replace them all with LEDs. Another bulb burned out so I now have 2 LEDs and 2 incandescent. The lights in question are in a main hall so they're on most of the time. I figure an average of 10 hours a day almost all year. We'll ball park it at 350 days a year. Thats 3500 hours of use annually. Could very well be less than that but I'm just estimating here. If I replace the 35W incandescents with the 6W LEDs then I'll save 29W each. That comes out to about roughly 100 kWh a year or $10 in annual savings. I haven't yet replaced the two remaining incandescent bulbs because I'm waiting for them to burn out before I replace them. It just seems a waste to remove a working bulb like that. The LEDs are rated for 25,000 hours of use. 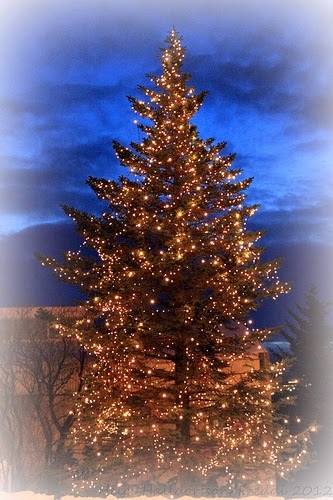 The incandescent bulbs are expected to last just 2500 hours. I think I'm getting longer life out of the incandescents but can't say for sure. There are two components to the cost. The cost to buy the bulbs and the cost of the electricity to operate them. If I was at the store comparing these two options then there would be no contest. The LED wins hands down. It costs 10¢ / 100 hr vs 47¢ for the incandescent. However I have a partially used incandescent installed right now and my decision is between : option A) leave the LED on the shelf and continue to use the incandescent and option B) remove and throw away the partially used incandescent and install the LED in its place. The electricity cost is clear. Option A will cost me 35¢ and Option B will cost 6¢. How I account for the cost to buy the bulbs in Option A versus Option B isn't clear to me. For some reason I can't seem to wrap my head around this. I've already bought both bulbs so that money is spent and its a sunk cost. But if I use one or the other bulb it will save me buying another bulb which is minimum 6¢ /100hr to operate. Huh? I've confused myself. Maybe a helpful reader can help me untangle this. In any case no matter how I cut it I'm pretty sure the 35¢ /100hr electricity cost of running the incandescents outweighs everything else. Say I figure that throwing away the incandescent is wasting 12¢ for the incandescent bulb and then using the LED costs me 4¢ for the cost to buy that plus the 6¢ in electricity. Add that all up and throwing away the incandescent and using the LED instead comes out to 22¢ total. But continuing to pay electricity for the incandescent is 35¢. So I seem to be spending a minimum of 13¢ / 100 hr to continue to operate those incandescent bulbs. Planet Money has an interesting tale of How Stuff Gets Cheaper which mostly focuses on the company Monoprice. Home heating generally uses gas, electricity or oil. The prices of those fuels go up at different rates. (Or in the case of gas more recently goes down). Lets look at how the prices have looked over the past 35 years. I got the data from the BLS price indexes. In the charts below I normalized the prices to 1979 = 1.0 and then adjusted from there. 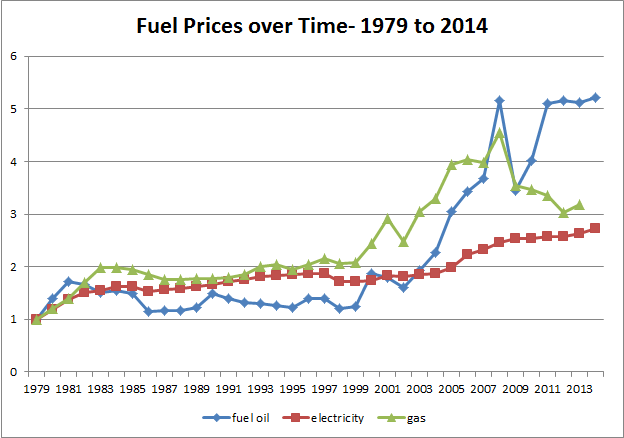 The 1979 prices were : Fuel oil was 0.728, electricity was .05 a KWH and gas was 31.8 for 100 therms. 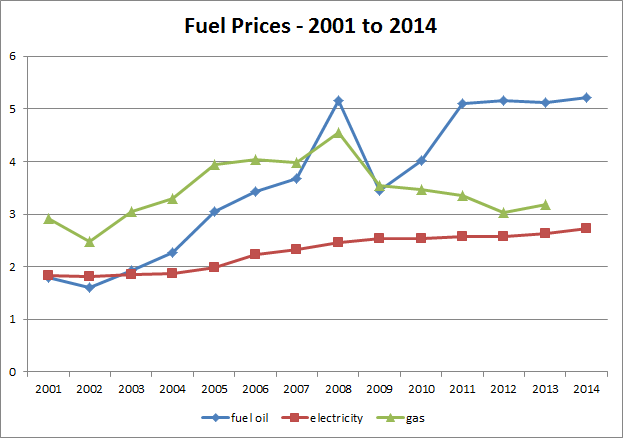 Note the gas data only goes up to 2013. At Gyft.com you can get $40 of Amazon gift cards for $30. You can also buy other brands of gift cards if you want, I'm using Amazon as its most flexible. Other options include : Kohls, Home Depot, Starbucks and many others. 3. Make another separate purchase of a $25 Amazon gift card using FDFAMILY promo code. This full deal works like this only if you're a new Gyft member and using Google wallet to check out. If you're not a new member you can still use the FDFAMILY to get $5 off a $25 purchase.